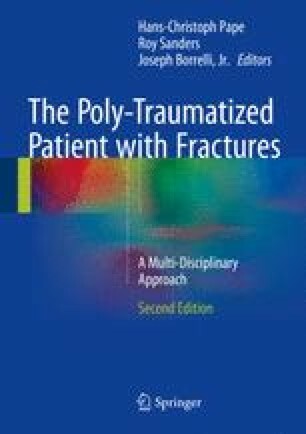 The management of traumatic bone defects requires explicit knowledge of vascularity, options for soft tissue coverage and bone regeneration. Therapy should begin directly after admission and includes temporizing stabilization of the limb. This should be in association with initial bone and soft tissue debridement and revascularization if needed. Then, the limb is definitively stabilized with near anatomic length, alignment, and rotation as well as restoration of a soft tissue envelope. In most cases, the bone defect is frequently managed at this stage with a temporizing antibiotic PMMA spacer to induce an osteogenic reactive membrane while ensuring a sterile environment. An enhanced biological and sterile bed is thus created for subsequent bone grafting at 4–6 weeks. At this stage, bone regeneration is accomplished by autologous bone grafting using conventionally harvested iliac bone grafts or reamed intramedullary harvest from the femur or tibia. Resorbable polymer membranes can also be utilized if needed to contain the bone graft in situations such as vertebral column defects with exposed neural elements or in the forearm to minimize the formation of a synostosis. This algorithm allows for early function of the affected limb with widely available implants and conventional surgical techniques. The morbidity is relatively low and the success rate is high for regeneration of commonly encountered traumatic bone defects.